The different ways in which Auditory Integration Training (AIT) can be done are: Our Practitioner-led programme or our Distance programme. Find out which will suit you best. Auditory Integration Training (AIT) is a powerful educational music programme aimed at helping children and adults succeed in social interaction and learning ability. It is often used with people who have ADHD, ADD, dyslexia, hearing sensitivities, autism, developmental delays, poor concentration, speech and language problems and a variety of other special needs. One of the light therapy devices used by Sensory Clinic was developed by Dr Jacob Lieberman who has worked effectively with more than 15000 individuals from the learning disabled and physically/emotionally traumatised to business executives and Olympic athletes. It has been approved by the FDA in the USA. Language seems to be improved – use of lots of new words and some really fluent, more grown up language creeping in. Teachers have commented about how well she’s doing. Generally Sarah seems to be less sensitive to sound and possibly less apprehensive about life in general. Her mood seems cheekier than it was – lovely! 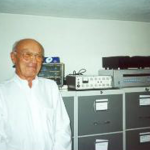 Sensory Clinic salutes Dr Guy Bérard, pioneer of Auditory Integration Training (AIT). Dr. Guy Bérard (1916-2014), accomplished Ear Nose and Throat (ENT) specialist and pioneer of the Auditory Integration Training intervention. Sensory Clinic appreciates the amazing legacy that Dr Bérard left.